The Arkansas Razorbacks are a team on the rise, with an innovative coach and an offense that's fun to watch and tough to stop. Unfortunately, the Hogs play in the SEC, more specifically the SEC West, where Alabama, Auburn and Louisiana State, who have combined to win four of the last eight BCS National Championships, reside. So while 10 wins and a BCS bowl berth are all fine and dandy, the ultimate goal, an SEC Championship, is going to be hard to come by. Last year Arkansas had 17 returning starters, including QB Ryan Mallett, which had Hog Nation thinking big. The Razorbacks started 3-0, and then had Alabama down 13 in the third quarter. But they gave up the last 17 points to the Tide to lose, 24-20. Then after a win over Cotton Bowl-bound Texas A&M, the Hogs blew a fourth-quarter lead and lost to eventual National Champion Auburn. Arkansas then won six in a row, beating eventual East Division champion South Carolina and LSU along the way, to earn a trip to the Sugar Bowl, where they lost a close one to Ohio State to finish at 10-3. The Hogs also went a profitable 9-4 ATS last year, helped along by an SEC-best +101 YPG differential. And they went 8-6 on the ‘over/unders,’ as Razorbacks games averaged 60 points per contest. This year Arkansas welcomes 13 starters back, but they'll have to deal with the loss of Mallett, who left college one year early for the pros. Nonetheless, the Hogs should still be explosive on offense and better on defense as they quest for a division title. Bobby Petrino is entering his fourth year as head man at Arkansas after a very successful stint at Louisville and a disastrous three-quarters of a season in the pros with the Falcons. Arkansas has progressed from 5-7 in his first season to 8-5 his second and 10-3 his third. There's no doubt Petrino has a knack for creating offensive powerhouses, and the defense has gotten better, improving from allowing 31 PPG his first season to 23 PPG last year. And over the course of the last two years Arkansas is 16-8 ATS. But they're 0-3 SU against Alabama under Petrino, and that must change. Six starters are back from a unit that led the SEC overall with 479 YPG in league play and ranked second in scoring at 36 PPG, doing most of their damage through the air. The Hogs get back 1,300-yard rusher Knile Davis and almost the entire receiving corps, but they lose Mallett and three from the O line, including both tackles. Junior Tyler Wilson looks like the new starting QB, and fortunately for him he'll work with one of the best sets of skill players, not just in the SEC, but in the nation. Seven starters return on this side of the ball for Arkansas, including five of the front seven. But this unit ranked eighth overall in league play last year, allowing 378 YPG, and just 10th in conference play vs. the run, giving up 183 YPG on the ground. They did, however, lead the conference in sacks and ranked third in forced turnovers, although those numbers might have had something to do with opponents trying to keep up with the Hogs on the scoreboard. Three are back on the D-line, which is probably the strongest part of this unit, and overall this should be the best defense Petrino has had here. The Hogs warm up with three home nonconference games, so they should be 3-0 when they visit Tuscaloosa Sept. 24. Arkansas then steps out of SEC play for a game with an old Southwest Conference rival, Texas A&M, at Cowboys Stadium in Arlington, then hosts defending National Champion Auburn. After an off week they get a couple of winnable road games at Ole Miss and at Vandy, then three straight home games vs. South Carolina, Tennessee and Mississippi State. The Razorbacks then end the regular season playing for the Golden Boot in Baton Rouge on the day after Thanksgiving. So while Arkansas misses the favorites in the East Division, Georgia, and Florida, they have to play the top two contenders in the West on the road. 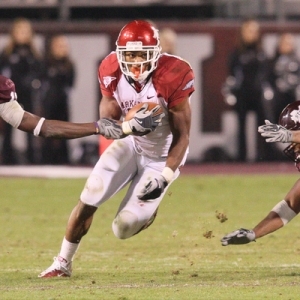 Sportbet is listing Arkansas at +725 to win the West Division and at +1,500 to win the SEC title. And Bodog is offering the Hogs at 30/1 to win the BCS Championship. And if you think they can split their two games at 'Bama and at LSU, any of those prices might be tempting. Arkansas is an interesting outfit. With a new starting quarterback we might expect the offense to take a small step backward this year, but the defense should be better. However, having to play at Alabama and at LSU, not to mention Texas A&M in front of what is likely to be a hostile crowd, makes for some tough going. We'll call for nine regular-season wins this year. Doc’s Sports is set to embark on our 40th year of handicapping college football. Doc is coming off a profitable season with his college football picks, including winning his Big Ten and College Football Games of the Year. Doc spends the hours during the week studying the college football odds and releases 6-8 college football plays per week including top plays (6-8 unit selections). Doc is ready to start the first week of September and our Magnificent 7 Packages gives you every college football selection that we make through the BCS Championship Game in January of 2012. Jump on board now with one of the best college football handicappers in the business.